Front, back and side views are available for use. Each of them has his/her own props so that you can attach the props to the characters flexibly. Not only are you able to control each character's facial expressions but you are also able to choose a variety of hand gestures to convey their emotions. 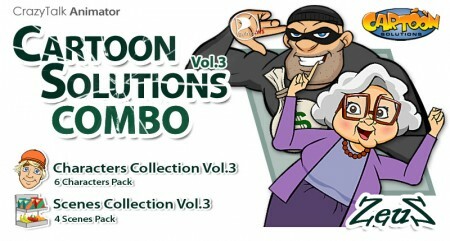 4 packs include a plenty of objects with gorgeous cartoon styles, all designed to enhance your projects. Please share Cartoon Solutions Combo Vol.4 and Cartoon Solutions Combo Vol.5. I'm looking forward to it.you are awesome. thank you again. I love CrazyTalk Animator - Cartoon! thank you. You're the man!